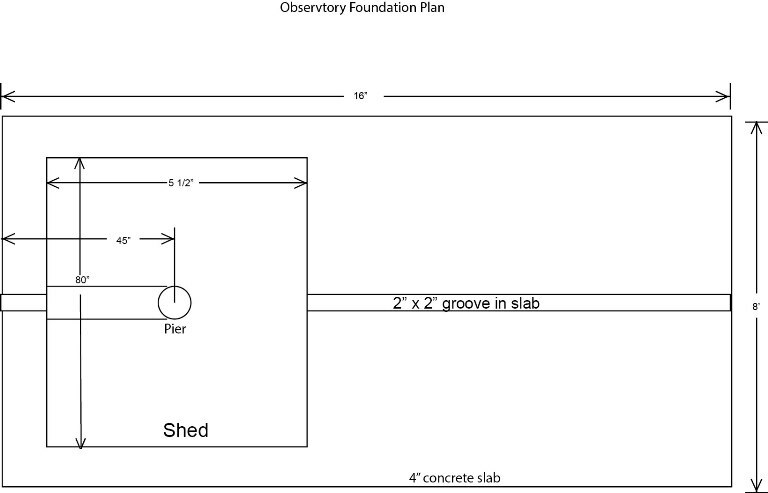 I am looking for ideas for a small, relatively low cost observatory. I am in California on the coast, and the climate is usually temperate except for fog, common in summer. My large scope is a 6" Bresser refractor. I just got a CGEM mount and would like to keep it set up so I don't have to polar align each time I want to use it. The scope could be brought indoors between uses. 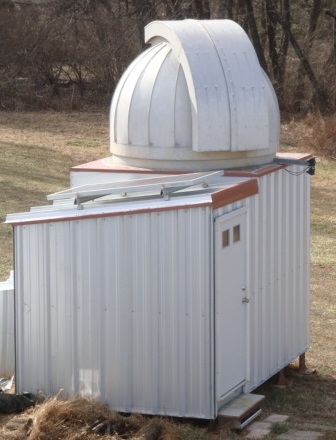 If someone has an observatory for sale transportable a few hundred miles by rental truck or trailer, I might be game. My budget is probably less than $3000.00. I am kicking around ideas of a rollable shed, or shed with rolloff roof. A dome would be nice. For a $3,000 budget I'd be guessing a ROR shed would be more likely. SkyShed sells plans for that. 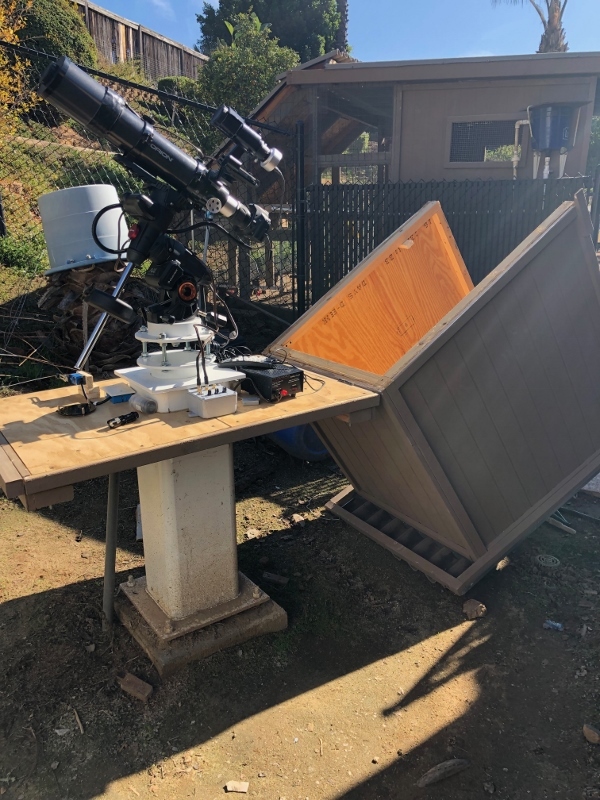 I think the cost would be too high, but Tuff Shed has actually made a ROR observatory. But I'd be getting plans from either SkyShed or from Backyard Observatories and figure on building the thing myself in order to even hope to stay within that budget. Check out this thread, it has almost every type of observatory in all different price ranges. Also the way I cut cost on my observatory was to check out places like craigslist and other markets. There are ads for low cost and free building materials. The dome, I rescued from a construction site that was going to be torn down. The framing and metal siding I got from a commercial construction site that was left over cut offs and going to be thrown out. Edited by siriusandthepup, 25 March 2019 - 08:09 AM. Unless I can find someone selling one cheap, it looks like a resin roll-away shed will be the way to go. I am wondering about the best way to put it on rails? I can get a concrete pad made. With a roll of building give some thought to critter-proofing. Mice can wreak havoc. Google around for "motel-o-scope" and you will see some interesting efforts. Here is mine. I got the steel for the pier at a scrap yard, had a buddy weld it together, and made the tilt off walls/roof from basic lumber supplies from Home Depot. Critter proof, water proof, and easy to open. Looks good! Very efficient use of space too! I see you are in Los Osos - my daughter is attending Cal Poly now. By the coast you may have more rain than we do here. I would recommend in that sort of climate that you pay particular attention to weather proofing and dehumidification. I just keep a container of Damp Rid in mine and that seems to work out fine, but in wetter areas more may be needed. Of course that goes for any enclosure. The biggest problem with this enclosure is that if I get a new scope or mount it may not fit. For example, this was originally designed to house a fork mounted 10" LX 200 and it just so happens that the AVX shown in this image and my new CEM60 both fit in there with the ED80, but the LX200 OTA on the CEM60 is just a tad too tall. I could add to the bottom of the enclosure and make it taller but then weight issues come into play. I have no problem leaning this enclosure on and off the base as it is on hinges but at some point the weight will be an issue. I would also like to figure out how to automate it opening and closing. With the weight there is no clear solution so I am also contemplating building a set of rails off to the hillside to the left in this image and having the observatory "floor" right about where it is now - supported by the pier and perhaps a few posts - and then having slide off enclosure. This way I could even add a second pier if need be although access becomes an issue. I have also contemplated building the tilt off enclosure out of aluminum which would be much lighter, but that is not in my current skill set. I have used this pier with two versions of this enclosure for about 15 years so it is working well enough for now. Once my kids are out of college and we decide whether to stay here or move elsewhere I will decide on any further investments in a bigger observatory. 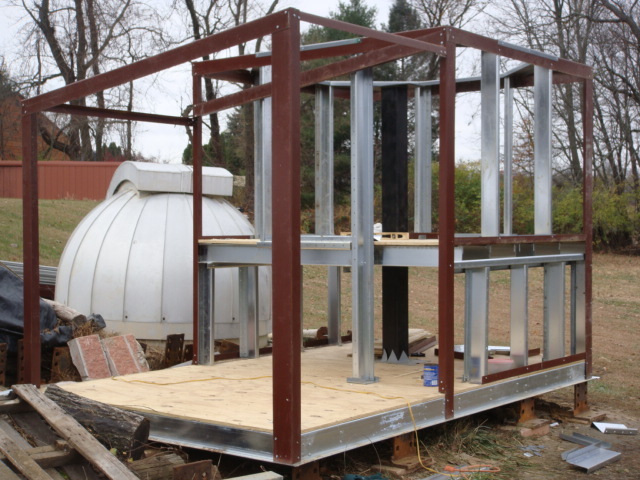 You can build a 8x8 observatory for less than one of those plastic sheds. Just make four walls, one wall with door. You can use 4X8 plywood or OSB panels. Bolt the corners of each wall, and set over a treated 2x4 floor. For the roof, just used 1x4 construction and lightweight materials that you can “lift” off in the manner of a shoebox. I have heard these called “shoebox observatories”. You can build it in a day for less than a plastic shed...Oh, I would clamp down the roof to the walls with large C-clamps. My roof went for a “walk” in a wind storm as it tore through the hook and eye latches. So C-clamps. Mine may give you some ideas...…. I think I am inclining towards a slideoff shed. The doors open wide on this one, and it could slide completely free of the scope with no obstructions. True, you could probably build one for less, but I think wood would be heavier, and this is quick, easy and presumably waterproof. I can get a concrete slab poured probably for $1500.00; not sure about about putting in a pier...I don't mind the tripod, as long as it stays in one place. I also have two different mounts. I am wondering what to use for rails? Steel right angle channel bar would be easy, but I am concerned the wheels would bind on the sides...seems like wheels on the sides and bottom would be a good idea. Obviously, you build the tracks and base, and then mount the shed on that. Please show me any links for piers or adapters for the Celestron CGEM mount. Edited by PABresler, 26 March 2019 - 01:13 AM. That's true even with fixed building. My solution was to elevate it, and build like I plan to live inside. I obsessed over rodent proofing. YOu do not need rails if you have cement underneath. It can just roll along. (Actually, I just run along on paving stones. Works fine. Something to consider, the floor panel for most of the resin sheds is a structural member. So if you do decide to make it into a roll-away structure, you will need to make a wood frame to reinforce the cutaway floor. But the wood frame does give a convent location to mount wheels. 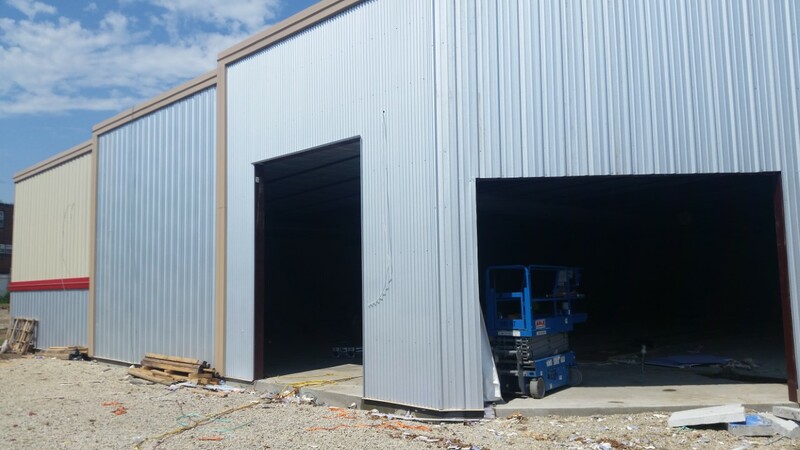 THe roof structure itself also adds to the integrity of those plastic sheds.So, consider how well it will work when removing the roof. The shed might be a little larger to accommodate my 6" refractor. I think this will come in under $3000.00. I also like no obstructions from a roof. Just garden wheels work fine. You can get them at ACE or other places. Nothing special. You will not need a winch to move the thing. It just rolls on the concrete. And the groove in the slab is a place to collect water, dirt, and trip. I think I will put in the groove. It would be difficult and expensive to do after the pour, and opens the option for power movement. It can easily be covered with a piece of metal or wood, even with the cable in place. It will be nice to move the shed with the flick of a switch, especially in the dark. A garage door opener also is a consideration, but the excursion is only 80"; I want to really get the shed out of the way for observing. I'd recommend sloping the floor of the groove towards the rear of the slab. This will provide drainage for any water that gets into there. You can also hollow out the ground under the groove before pouring the slab to maintain the slab thickness. Add an anchor bolt at the back of the slab for a future cable attach point. Don't forget that if you encounter below freezing temperatures while there's any water in the groove, the freezing water will expand, creating forces that could be large enough to crack the concrete.